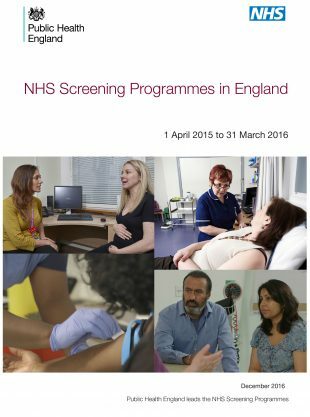 Today we have published our report highlighting the fantastic work of the 11 national screening programmes in England from 1 April 2015 to 31 March 2016. The NHS Screening Programmes in England 2015 to 2016 report (right) is full of examples of why our programmes are held in such high regard worldwide in improving public health. During the year we carried out more than 21 million screening tests for all conditions. Cervical screening alone saved an estimated 5,000 lives and the millionth man in England was screened for abdominal aortic aneurysm. The report includes high level screening and outcome data for each of the 11 programmes – and a brief explanation of what we screen for and why. We continuously seek to improve the quality and efficiency of all our programmes. I'd like to thank all the screening teams, our many partners and stakeholders for their efforts in achieving this during the 2015 to 2016 screening year. We want to make sure we provide you with information about the NHS Screening Programmes in the format that is most useful to you. This year's report is, as usual, available to download as a PDF from GOV.UK in addition to a small print run of hard copies for important stakeholders. However, we're well aware that people access information in many different ways – video and audio clips, blogs and tweets to name but a few. As a result, this year's report might be the last that we publish in our traditional format. You can help make sure we get the format right for next year and beyond. All you need to do is fill in our brief online evaluation of this year's report. The survey should only take 5 to 10 minutes to complete.